Created on Nov. 21, 2012, 4:41 p.m. by Hevok & updated by Hevok on May 2, 2013, 4:56 p.m.
Cellular senescence is the exhaustion of cell division potential [Hayflick & Moorhead]. Senescent cells are present in aged tissues taken from variety of species, including mice, baboons and humans [Herbig et al. 2006; Jeyapalan et al. 2007; Wang et al 2009]. In fact tissues from aged aged animals are a mixture of senescent cells interspersed with normal cells (old, perhaps age-compromised cells but not yet senescent) [Bahar et al. 2006; Herbig et al. 2006]. The number of senescent fibroblasts increases exponentially with age in the skin of baboons. Senescent cells are over 15% of cells in very old animals . Senescence cells are also present in mouse tissues such as in the liver . Senescence can be triggered by several stressors that result in molecular damage or simple by exhaustion of replicative potential [Adams 2009]. Cellular senescence is characterized by biochemical events that occur with the cell leading to growth arrest as well as loss of specialized cellular functions [Campisi et al. 2002]. Senescent cells cannot divide, their ability to synthesize proteins is reduced, and the DNA repair system is attenuated [Hasty et al. 2003]. Senescent cells impair tissue renwal and homeostasis, decrease organ funciton and contirbute to the aging phenotype. Telomere shortening with age contribute to cancer susceptibilityby increasing the risk of chromosomal aberrations . Mice with short telomeres have higher cancer incidence , including in mice deficient for p53 . Senescent cells secret pro-inflammatory cytokines and other factors that disrupt the tissue microenvironment and promote tumorigenesis. Immunocompromised mice injected with tumor-forming cells together with senesecent cells form more and larger tumors that tumour-forming cells alone or with presenescent cells [11593017; 20169192; 17409418]. Senescent cells derive a inflammatory network dependent of interleukins that promotes cancer . The clearance of senescent cells expression p16INK4a, although it does not extend the lifespan, delays aging-associated disorders in progeriod mice . 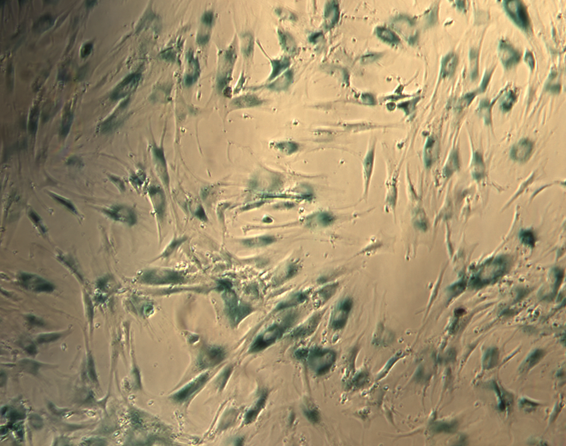 Senescent human fibroblasts stimulate profileration of premalignant and malignant epithelial cells, but not of normal cells in cell culture . Hayflick, L. & Moorhead, P.S. (1961) The serial cultivation of human diploid cell strains. Exp. Cell Res. 25, 585–621. Herbig, U., Ferreira, M., Condel, L., Carey, D. & Sedivy, J.M. (2006) Cellular senescence in aging primates. Science 311, 1257. Jeyapalan, J.C., Ferreira, M., Sedivy, J.M. & Herbig, U. (2007) Accumulation of senescent cells in mitotic tissue of aging primates. Mech. Ageing Dev. 128, 36–44. Wang, C., Jurk, D., Maddick, M., Nelson, G., Martin-Ruiz, C. & von Zglinicki, T. (2009) DNA damage response and cellular senescence in tissues of aging mice. Aging Cell 8, 311–323. Bahar, R., Hartmann, C.H., Rodriguez, K.A., Denny, A.D., Busuttil, R.A., Dolle, M.E., Calder, R.B., Chisholm, G.B., Pollock, B.H., Klein, C.A. & Vijg, J. (2006) Increased cell-to-cell variation in gene expression in ageing mouse heart. Nature 441, 1011–1014. Adams, P.D. (2009) Healing and hurting: molecular mechanisms, functions, and pathologies of cellular senescence. Mol. Cell 36, 2–14. Campisi J. Cancer and aging: yin, yang, and p53. Sci Aging Knowledge Environ. 2002;2002:pe1. Hasty P, Campisi J, Hoeijmakers J, van Steeg H, Vijg J. Aging and genome maintenance: lessons from the mouse? Science. 2003;299:1355–1359.